After sorting all the different kinds of waste items he found floating in his “ocean” Earth Day Sensory Bin, Onetime wanted to know where garbage goes. SO…we created a landfill sensory bin and a homemade recycling factory! Amazon Affiliate links have been included in this post. Please read my Disclosure for full details. 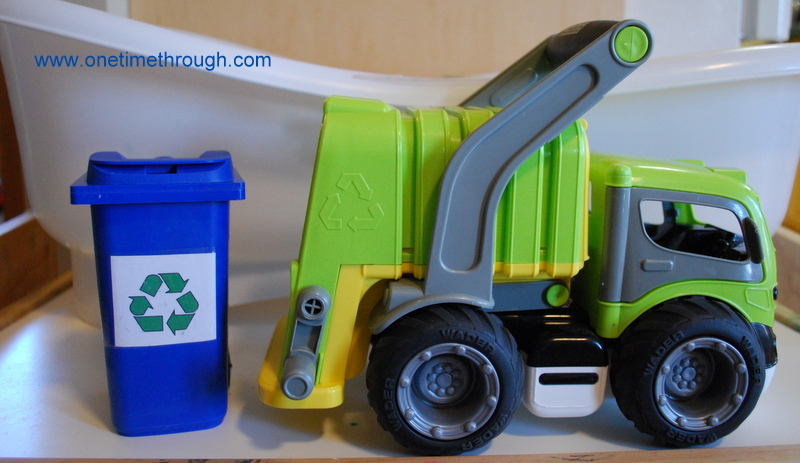 To begin, we got out one of Onetime’s favourite toys – his Wader Grip Garbage Truck! We talked about how garbage is taken in a truck to a landfill. To make our landfill, I filled an empty container with brown shredded paper for soil and then topped it with green shredded paper for grass. Once Onetime got the truck to the landfill, we talked about how garbage is just put in a hole in the ground and covered with dirt. So – that’s what we did with the garbage pictures! We also talked about how many of those items would remain there forever, just covered up and hidden. Did you know it will take over a million years for a glass bottle to break down and that many plastics never will? It was really interesting to watch Onetime’s facial expressions as I was explaining this concept to him. He seemed to find it confusing, as I think any rational person does when they really think about this! Next – we got the compost pictures from the Earth Day Bin and also drove them to the landfill bin. We buried those as well but talked about how with time, those items would all gradually become a part of the soil with the help of earthworms and bacteria. Last, we talked about how recyclable items go to a recycling facility to be made into new things. Onetime was really interested in this idea and when I asked if he wanted to make a factory – he eagerly agreed! At this point, we had already read The Magic School Bus Gets Recycled a few times and Onetime had a basic understanding of what a recycling factory looks like and does. Although, it’s difficult to find new copies of this book, I highly recommend it for kids aged 2 to 8. It has a great overview of what goes on in a recycling facility and the Magic School Bus series of books are always highly engaging and full of fun! Back to our play – to make our recycling facility, we got a box, a couple of toilet paper tubes, some paper for signs, and permanent markers to decorate. After our recycling factory was made, Onetime had a lot of fun bringing the recyclable items to the factory and dumping them inside. We talked a bit about what kinds of things the factory would make using the items – new paper, egg cartons, new cans, etc. Onetime seemed to really enjoy learning about where all the different kinds of garbage go! I think that next week when the garbage goes out, he’ll have a whole new perspective on things! After delivering all our waste to the appropriate places, Onetime continued to play with the Earth Day Sensory Bin, his homemade Recycling Factory, and Landfill for almost an hour. Definitely – a rich learning activity! Do you have some ways to encourage your children to think about waste reduction? I’d love to hear them! I hope you give this homemade landfill and recycling factory play a go! Happy Earth Month! Follow One Time Through’s board Earth Friendly Activities on Pinterest.